Now, iPhone 4 is so hot all over the world; it is the mark of popularity and even high tech. For example, the cool 3.5 inches multi-touch display with 960*640 pixel resolution at 326 ppi is much better than other portable devices even some normal computers. The iPhone 4 perfectly supports HD videos recording and playback. But for video playback on iPhone 4, we may still need some related video converter. WMV is short for Windows Media Video which is developed by Microsoft. iPhone 4 is powerful enough to run HD videos, but for common video formats, it just support M4V, MP4 and MOV. But WMV is just beyond the service. How can the Apple support his competitor? So, commonly we have to convert WMV to iPhone 4. But how to do that? For 'how to convert WMV to iPhone 4', it is easy. By downloading one converter, just a few steps, all processes have been done. But for video playback on iPhone 4, there are some details we have to pay more attention to. iPhone 4 contains the 3.5 inches display with 960*640 pixel resolution, it fully supports HD videos. So, for the perfect video enjoy, we need a professional video converter which supports HD standard to convert video to iPhone 4 with the perfect resolution and right video size. 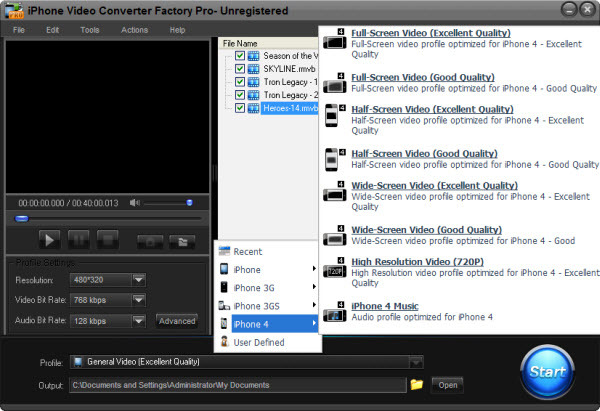 First, from the mess of video converters, I suggest iPhone Video Converter Factory Pro to all users. It is the professional software for converting video to iPhone. The software provides fast conversion speed and good image quality. All advanced functions (merge, clip, crop and effect) are available for users to edit videos. Besides, it is easy to use. That's the whole process. It is really easy for us. iPhone Video Converter Factory Pro is really a powerful and all in one video converter software, it can help you convert any of your videos to iPhone series compatible videos easily. With it, you can Convert MKV to iPhone, help you enjoy the HD MKV file on your iPhone easily. What’s more, you can also Convert video to the popular iPhone 4 , enjoy any videos on your iPhone 4 freely. For people who like watching online YouTube videos, iPhone Video Converter Factory Pro can also help you Convert YouTube FLV videos to iPhone, you can enjoy tons of wonderful FLV videos on your iPhone as your will. For people who like listening to music with iPhone, iPhone Video Converter Factory Pro also can be used as a professional music converter, it can help you convert OGG to iPhone 4, convert FLAC to iPhone 4 and Convert WMA to iPhone 4. At last, if you want to know more features of iPhone Video Converter Factory Pro, please see the product page of this software. And, if you want to know more about how to use iPhone Video Converter Factory Pro, please see the User Guide of this software. How to Play Flash on iPad? How to Put YouTube Videos to iPod Touch? How to Convert FLV to iPod Touch 4? 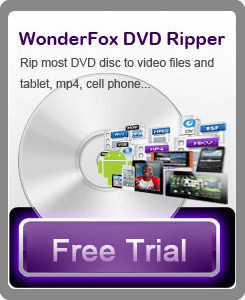 How to Convert WMV to iPhone 4? How to Convert MPEG to iPod Touch 4?